I didn’t go looking for grief this afternoon, but it found me anyway, and I have designers and programmers to thank for it. In this case, the designers and programmers are somewhere at Facebook. I know they’re probably pretty proud of the work that went into the “Year in Review” app they designed and developed, and deservedly so—a lot of people have used it to share the highlights of their years. Knowing what kind of year I’d had, though, I avoided making one of my own. I kept seeing them pop up in my feed, created by others, almost all of them with the default caption, “It’s been a great year! Thanks for being a part of it.” Which was, by itself, jarring enough, the idea that any year I was part of could be described as great. A picture of my daughter, who is dead. Who died this year. And I know, of course, that this is not a deliberate assault. This inadvertent algorithmic cruelty is the result of code that works in the overwhelming majority of cases, reminding people of the awesomeness of their years, showing them selfies at a party or whale spouts from sailing boats or the marina outside their vacation house. 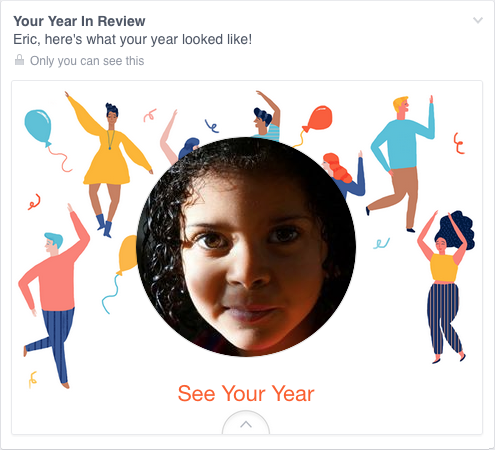 To show me Rebecca’s face and say “Here’s what your year looked like!” is jarring. It feels wrong, and coming from an actual person, it would be wrong. Coming from code, it’s just unfortunate. These are hard, hard problems. It isn’t easy to programmatically figure out if a picture has a ton of Likes because it’s hilarious, astounding, or heartbreaking. Where the human aspect fell short, at least with Facebook, was in not providing a way to opt out. The Year in Review ad keeps coming up in my feed, rotating through different fun-and-fabulous backgrounds, as if celebrating a death, and there is no obvious way to stop it. Yes, there’s the drop-down that lets me hide it, but knowing that is practically insider knowledge. How many people don’t know about it? Way more than you think. This is another aspect of designing for crisis, or maybe a better term is empathetic design. In creating this Year in Review app, there wasn’t enough thought given to cases like mine, or friends of Chloe, or anyone who had a bad year. The design is for the ideal user, the happy, upbeat, good-life user. It doesn’t take other use cases into account. Just to pick two obvious fixes: first, don’t pre-fill a picture until you’re sure the user actually wants to see pictures from their year. And second, instead of pushing the app at people, maybe ask them if they’d like to try a preview—just a simple yes or no. If they say no, ask if they want to be asked again later, or never again. And then, of course, honor their choices. It may not be possible to reliably pre-detect whether a person wants to see their year in review, but it’s not at all hard to ask politely—empathetically—if it’s something they want. That’s an easily-solvable problem. Had the app been designed with worst-case scenarios in mind, it probably would have been. If I could fix one thing about our industry, just one thing, it would be that: to increase awareness of and consideration for the failure modes, the edge cases, the worst-case scenarios. And so I will try. Note: There is a followup to this post that clarifies my original intent, among other things. A slightly revised and updated version of this post was published at Slate. 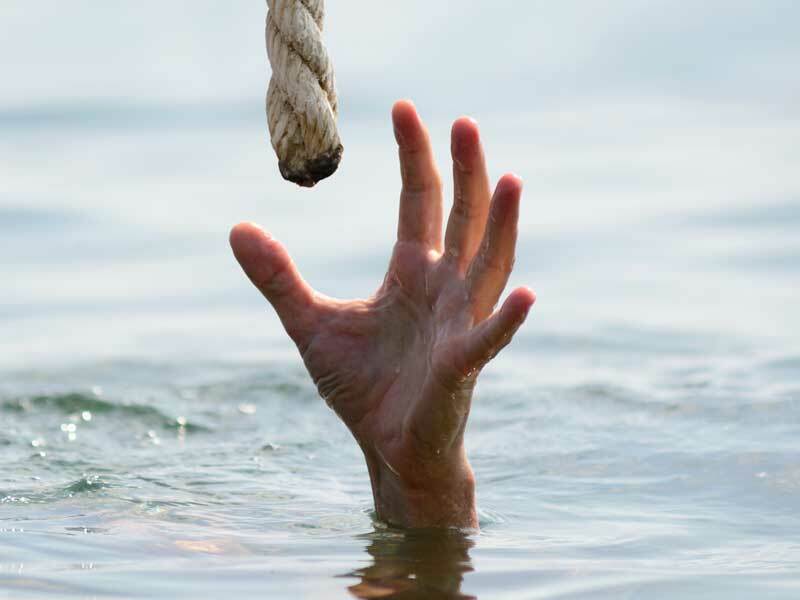 Even “Designing for Crisis” will have some new aspects to it, as I discover ways to strengthen it and loop in some new thoughts and discoveries. As an example, I just recently had a great chat with Amy Cueva, who gave me some really sharp insights into how I can share the message even more effectively. I expect that kind of iterative improvement to continue throughout the year, given how new the topic is to me, and possibly to everyone. It’s been something of a surprise to have many people tell me it’s caused them to see their own work in a whole new light—even people working in fields where you might think they would already be on top of this. I’m really excited to bring this talk to people at AEA, and elsewhere as opportunities arise. I hope it will do some good in the world. In parallel with that ongoing effort, I’m getting back to writing more than just the occasional blog post. I’ve restarted work on the fourth edition of CSS: The Definitive Guide —details on that will be forthcoming just after the holidays. I’m also starting to write down some of the thoughts and approaches in “Designing for Crisis”, as well as some nascent thoughts on network effects, responsibility, community, and guidance. I’m also trying to teach myself git so I can push out public repositories of my CSS tests and some bits of code I’d like to release into the wild, but honestly that’s pretty slow going, because it’s always a fifth or sixth priority behind my family, working on AEA, refining and rehearsing the new talk, and writing. Given everything that’s coming together, I really am looking forward to 2015 and a return to speaking and writing. For painfully obvious reasons, I was pretty out of the loop for nearly all of 2014, not to mention the last half of 2013. I tried to stay up to date, but it’s one thing to be in the middle of things, and quite another to observe things from a distance. (The mosh pit never looks like it feels, you know?) So in addition to all the other stuff, I’m working overtime to catch up, and that’s where I could really use some help from the community. So, tell me: what did I miss? What’s emerging that I should be (or should already have been) paying attention to, and what am I already behind the curve on? What has you excited, and what sounds so awesome that you’re hungering to know more about it? And maybe most important of all, where should I be going to get caught up? All input welcome, whether here in the comments, or out there on les médias sociaux. And thank you! Six months ago today, our child died in our arms. I still have trouble believing this. Kat and I both still have trouble. But only on occasion, these days, and not for long. As someone once said, when it comes to the death of a loved one, you don’t get over it, but you do, eventually, if you allow yourself, get used to it. We’re slowly getting used to it. Half a year. It seems like it’s been forever, as if uncountable years have passed since Rebecca died, and yet there are still so many traces and impressions of her that sometimes it seems as if she was only just here. We struggle, sometimes, to decide what to preserve and what to let go. We had to force ourselves to put the few boxes of mementoes we’ve kept into storage this past week. It felt like we were consigning Rebecca to the attic, which doesn’t seem like much when you think about it, but it was in some ways as difficult as consigning her remains to the earth. For that matter, we were recently making some changes to the family picture wall, and for each picture of Rebecca, we had to ask if it should stay up or come down. None of those choices were easy, even after half a year. We have thousands upon thousands of images of Rebecca; just in my iPhoto library alone, there are 10,188 photos tagged with her name, 1,624 of which I flagged or rated five stars (or both), 785 of which are on Flickr. Kat has thousands more, as do so many of our friends and relatives. Those pictures can take us back, clarify our memories, or remind us of some aspect of her personality. Myriad facets of a life so short, and yet so fully lived. Videos are far more rare—the Flickr album has just three—mostly because I greatly dislike shooting video. In the end, it didn’t matter. Our friend Jessica captured a video that is the quintessential Rebecca, a near-perfect distillation of Rebecca’s personality in just under ten seconds—all her sass ‘n’ spice, and all her sweetness too. Rebecca Alison Meyer, ladies and gentlemen. How I wish you could have known her as we did. I laugh every time I watch that video. Every time. As the funeral service for Kat’s aunt Judy ended, the sun slipped behind a bank of clouds. The mourners began to disperse, leaving the family to stand in the chill October air, talking quietly as they comforted Judy’s husband and children. Off to one side, Judy’s mother, Kat’s grandmother, stood stiff and drawn next to me, her eyes glistening with tears as she stared off at the horizon. I had already expressed condolences and couldn’t think of anything else to say, so I just stood there. After a few moments, she looked at the grave, then looked at me, and shook her head. 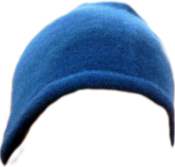 This past Sunday was Blue Beanie Day, the annual celebration of web standards that was established by Douglas Vos, taking as his inspiration the cover of Jeffrey Zeldman’s field-defining book, Designing With Web Standards . This year’s was the eighth annual celebration, and to mark the occasion, I replaced my purple-infused Twitter and Facebook avatars to sport blue beanies. That’s how much web standards mean to me. 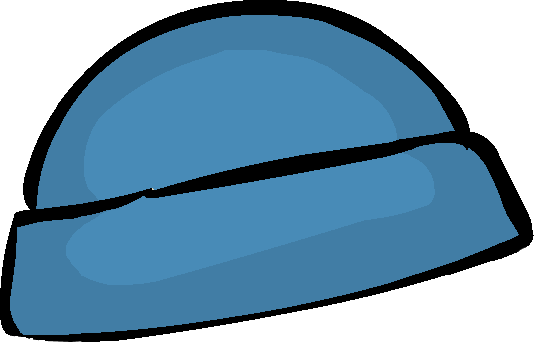 If you missed Blue Beanie Day—which, it being the Sunday of a major U.S. holiday weekend, many of you may well have—don’t let that stop you! Drop a cerulean toque on your social-media avatars, make a quick status update about why, and wear your pride in your craft and your love of the web on your sleeve. Head. Whatever. If you don’t have a beanie ready to hand, then here, feel free to use one of these. 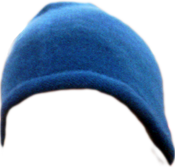 Every day is web standards day, of course, but Blue Beanie Day comes but once a year. It’s not too late to mark the occasion. As Ethan says, toque ‘em if you got ‘em!